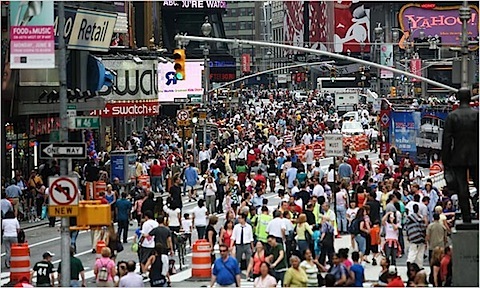 Back in 2005, I put up a blog entry entitled “Pedestrianize Broadway!” in which I waxed rhapsodic about Broadway being made a pedestrian thoroughfare at least from Columbus Circle down to Union Square. If the Broadway plan does succeed, the next step (though Sadik-Khan is not talking this way publicly) will likely be to close more sections of Broadway until one day in the near future the entire boulevard has been converted to pedestrianized open space. It’s hard to characterize how dramatic a change that would be. Imagine a Manhattan with two major parks: one built in the nineteenth century as a confined space of bucolic wonder; the other refashioned in the 21st century as a long, open boulevard slicing the island on the diagonal. This would be the most striking alteration of the city’s physical landscape since the days of Robert Moses. Oh, to see it happen! I’ve been telling people for a couple months that we could tear out most or all of the odd numbered streets without a long-term negative effect on traffic and with a positive overall effect on general citizen well-being. This is my current “craziest thing I believe”. Between the future of Broadway and the new Mid-Block Park, it looks like we’re going to get two “long open boulevard”-parks in lower Manhattan. Maybe three or four, if you count the Highline or the Hudson Greenway. The next step is to set aside a few major streets for pedestrians, plus one lane each way for bicycles and electric vehicles no larger than golf carts. This would keep the health effects of keeping out polluting vehicles. This needs to go much further, however, as part of a concerted effort to gradually reduce automobile traffic in cities, and enhance and encourage pedestrian access and public transit. We might start with implemented a (once rejected by Albany) congestion plan, increasing fuel taxation, increasing taxes and fees for ownership of private automobiles, increasing tolls on bridges, tunnels, and highways, and subsidizing public transit development, including reasonably priced and efficient light rail in every city in the nation. The sale of fake Gucci shoes is now a common event. But, the online shopping platform adds a fresh layer of deception. Individuals buying the fashionable shoes do not understand that the products they are buying are fake. Thanks for the comment and I really like it and I also want to share a link that help you to know the update information about the latest styles of shoes. If you are interested to know more about it then visit the link. I do not see a problem with this at all. I love this area by broadway. Mens Nike Air Max 360 Shoes white:Breathable mesh upper with supportive rand and 360 degrees of reflectivity.